Dolphins Resort, is world renowned for it's breathtaking destination weddings and featured in Wedding Bells Magazine, as one of "Canada's Loveliest Wedding Venues in 2016". Exchange your vows on our private sandy beach or on lush green grass surrounded by beautiful gardens & amazing ocean views. Our executive oceanfront venue, Discovery Lodge is in a prime location on the edge of the ocean, overlooking our private beach. With seating up to 100 guests, family and friends will enjoy culinary magic in a romantic intimate ocean view setting. Whether it's an intimate elopement or a large wedding with a hundred of your closest family and friends, Dolphins Resort specializes in making dream weddings become a reality. Beachfront, garden or indoor ceremony options, Indoor/outdoor reception venues up to 100 guests, culinary creations- from served appetizers, buffets to a five course dinner, experienced event coordination, special accommodation rates for your guests & private beachfront honeymoon suite. From bachelor fishing derbies to once in a lifetime glacier heli-tour photo opportunities, your dreams can be fulfilled. Dolphins Resort, has become world renowned for it's naturally breathtaking destination weddings and is proud to be featured in Wedding Bells Magazine, as one of "Canada's Loveliest Wedding Venues in 2016". 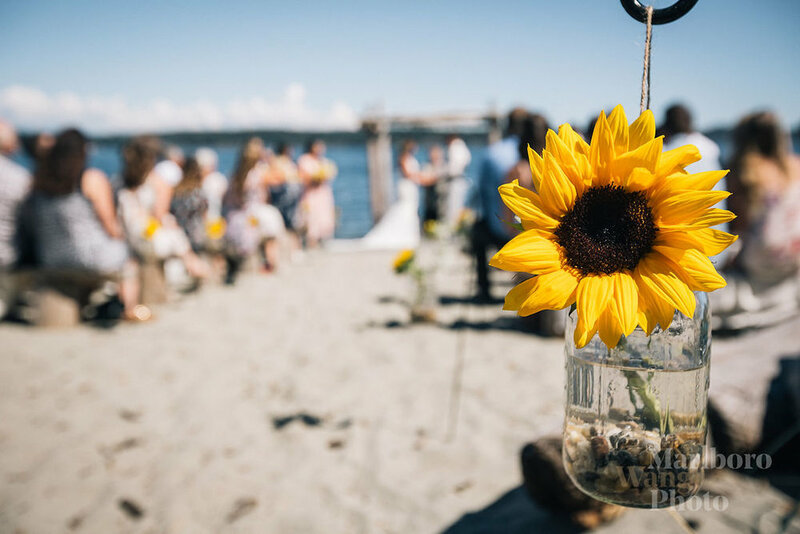 With an ambiance of old fashioned charm, our oceanfront resort is hidden amongst majestic firs and beautiful gardens, creating a private, tranquil setting for your special day. Picture yourself tying the knot on our sandy beach under Dolphin's renowned unique driftwood arch. 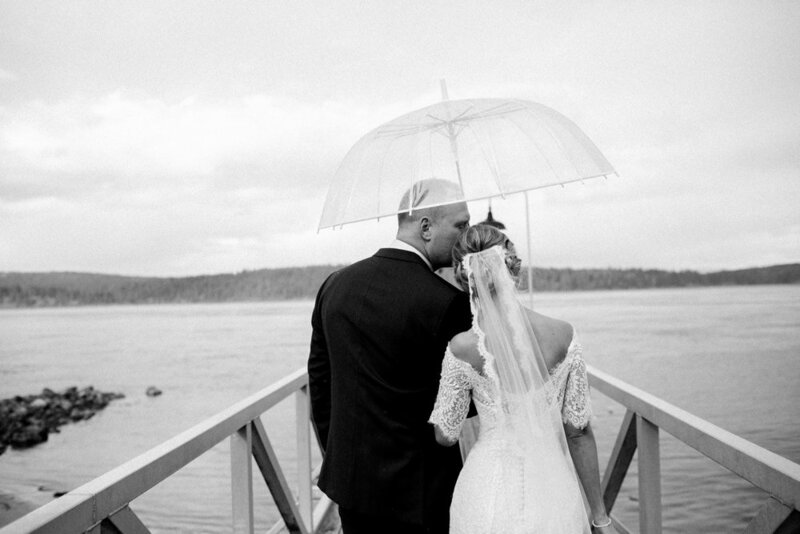 Whether it's a warm sunny day or a blistering cold rainy day, with our views of the Discovery Passage/Coastal Mountain Range and naturally landscaped gardens, you're set to have a memorable picturesque wedding with us. Our executive oceanfront venue, Discovery Lodge is situated in a prime location on the edge of the ocean, overlooking the beach. With seating of up to 80 guests and cocktail style for up to 120, family and friends will enjoy culinary magic in a romantic intimate ocean view setting. reception dinner is required for all destination weddings. The sky's the limit, literally, with what is available to you through Dolphins Resort. From bachelor fishing derbies to once in a lifetime glacier heli-tour photo opportunities, your dreams can be fulfilled. Please call 1-800-891-0287 or email us to find out how a wedding of your dreams, can be yours. Dolphins Resort, surrounded by nature and oceanfront beauty creates an inspiring, productive and calming environment for all group events. 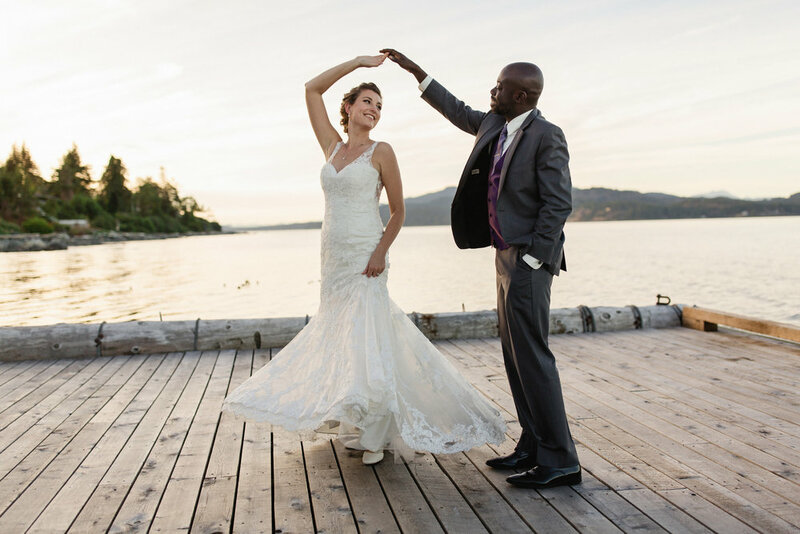 Our executive oceanfront venue, Discovery Lodge is situated in a prime location on the edge of the ocean, overlooking Discovery Passage and the Coastal Mountain Range. 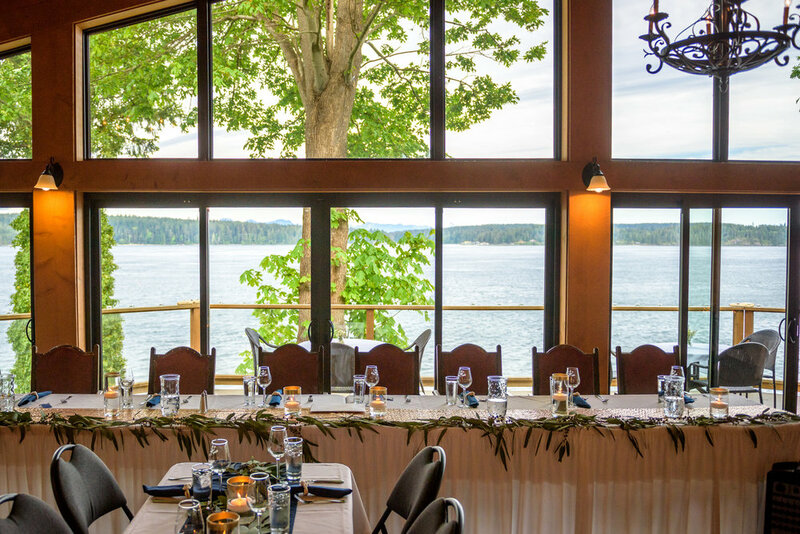 The spacious top floor of this lodge has held many group events and the breathtaking views and west coast culinary experience has always been the highlight. With over 1,500 square feet of meeting space, the room configuration can be customized based on your requirements. Whether you're needing a location to host corporate meetings, retreats, team building events, AGM's, family reunions or celebrations of life, we've done it all. Enjoy the view from indoors or on the outdoor patio, have the venue set with banquet tables and chairs or a more casual relaxed setting with rustic antique chairs and comfortable couches. This impressive oceanfront venue can accommodate 80 seated guests or up to 120 guests cocktail style. It features the perfect amount of natural light, a grand brick fireplace, fully equipped kitchen, wet bar, wireless internet with a large flat screen cable tv. Our in-house events coordinator can assist in customizing the services we offer to meet your individual needs. 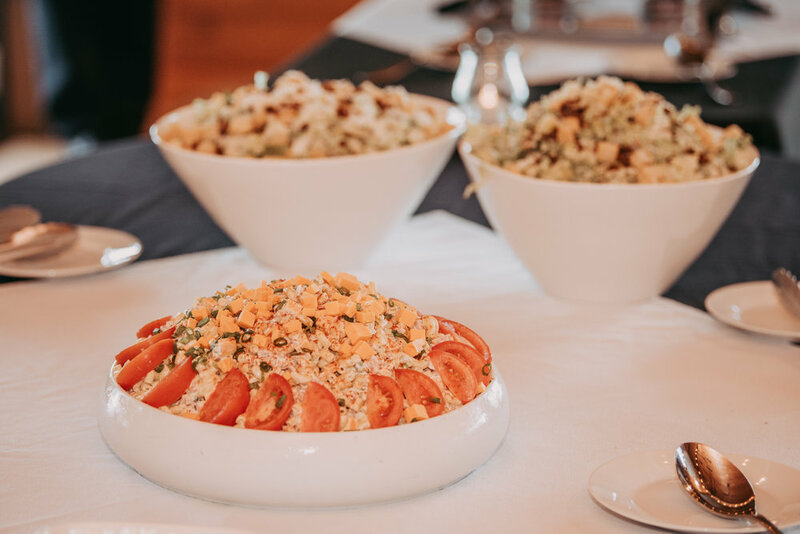 Extensive catering packages are available from appetizers, traditional buffets to multiple course plated dinner services, the options are endless. Venue space rental includes set up, tear down, banquet tables, chairs, linens and a variety of decor components. Create a memorable event by adding accommodations for your guests. From oceanfront and garden view fully equipped studios to four bedroom options, our cozy cedar cabins all feature something different. This unique combination can provide your guests with a blend of business and pleasure. For reservations or to inquire further about the benefits of having Dolphins Resort host your event, please contact us at 1-800-891-0287 or email for more info. We look forward to hosting your next group event.